Time of realization: February 12-14, 2008. Place of realization: International Exhibition Center “Crocus Expo”, Moscow. The International Specialized Exhibition “Composite-Expo” was successfully finished clearly demonstrating the approach of the main purpose, which was primordial forwarded by the Organizing Committee to carry out the event enable the exhibitors to establish new business contacts and partners relations, the event which could help to develop the composite branch and to broadly use the applied composite technologies in the different branches of industry. For the first time this brand international event was held in Moscow from the 12th till 14th of February, 2007 at the International Exhibition Center “Crocus Expo” (Moscow). It was organized by the Exhibition Company “Mir-Expo”. The general directions of the exhibition reflect the following subjects: the raw materials for composite materials producing, the components (resins, glass fiber cloth, etc. ); the stores, additives and modifiers; the equipment and technologies for composite materials producing; composite materials treatment tooling; the glass-fiber material, the artificial stone, the marezzo marble, the organic concrete, etc. ; the manufacture technologies provided for the composite materials of the special and defined properties; the joining systems intended for composites based products; the surface treatment technologies; the composite based industrial technologies; the composite materials usage in building industry and housing and communal services. We should mention the significant interest expressed by the foreign specialists, who took part in the exhibition as the exhibitors and visitors. The total amount of the exhibitors was about 30 organizations. There were among them the following companies: Group of Companies Composite (Russia), «Airtech Europe» (Luxemburg), United Trading System (Russia), Intrey, LTD (Russia), Bauman Moscow State Technical University (Russia), «Poliya» (Turkey), Naftaros-Rishon (Russia), Polotsk-Steklovolokno, JSC (Belarus), Steklonit Company (Russia), «Mikrosam» (Macedonia), Engineering Company AB Universal (Russia), Hius, JSC (Russia), Porcher Industries (France), etc. You can find the whole list of the participants on the web site at: www.mirexpo.ru. To the opinion of the specialists the exhibition was resulted in such a way successfully exceeding all the expectations. It highlights the increasing of the requirements of the Russian market as regards the use of the modern innovation composite technologies in the field of building and housing and communal services, machine building, shipbuilding, the air cosmic branch, electronics and in many others. To approach the goals of the main annual brand event in Russia the exhibition is called to become the important marketing, practical-research and analytical prerequisite for all of its participants. The International practical-research seminar “Modern State and Prospects of Development of Production and Use of Composite Materials in Russia” was run in the framework of the exhibition, the reports being provided by the specialists of “Airtech Europe S. A.” firm (Luxemburg) who made the report on “The process of the resin infusion applied to the shipbuilding“ and the representative of the Bauman State Technical University (Moscow) who made the report on “New polymeric composites intended for the pipelines and pressure reservoirs”. The Organizing Committee has obtained the favorable as a whole reviews concerning the exhibition. 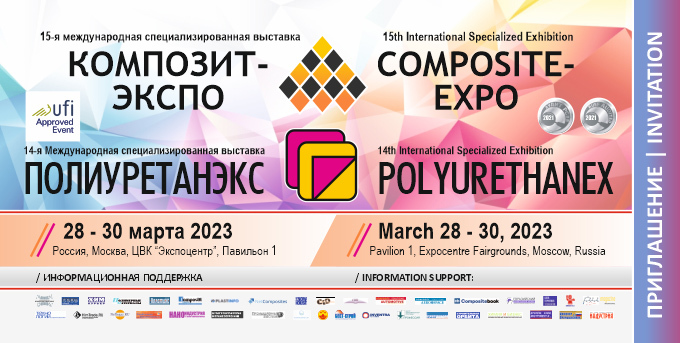 The great majority of the exhibitors have announced their intention to take part in the next Second International specialized exhibition “Composite-Expo - 2009”. It will be on February 25-27, 2009 at the Expocentr Fairgrounds of the Central Exhibition Complex “Expocentr” in Krasnaya Presnya, Moscow. The “Modern State and Prospects of Development of Production and Use of Composite Materials in Russia” practical-research seminar was held during the exhibition.